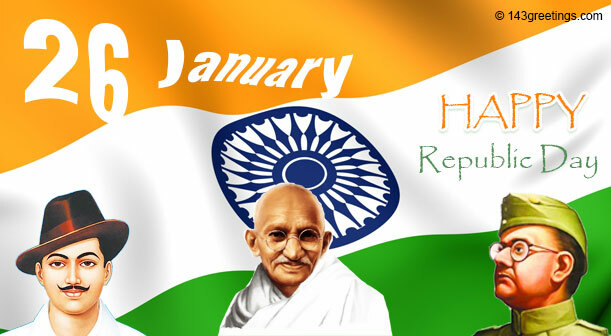 India, which is a secular and democratic nation became a republic on 26th January 1950. On this day, the Constitution of India was adopted by the Indian Constitution Assembly and it came into effect. 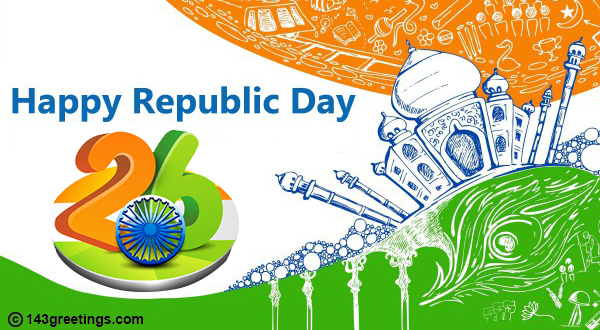 This 26th January India will be celebrating it's 70th Republic Day. This year let's take time to observe this occasion by spreading joy, peace, and patriotism amongst friends and family. Do not worry if you do not know what to write or send to your loved ones as 143Greetings has a great collection of wishes, messages, quotes, ecards and Whatsapp messages which you can send to your friends, colleagues, and family keeping alive the spirit of this festival. So, share amazing messages and wishes with your friends and family on any social media platform including Whatsapp, Facebook, Pinterest, and Twitter. The ecards, quotes, messages, and wishes are free of cost so send them now. After many years of slavery, we finally got our independence because of the sacrifices of our freedom fighters. Happy Republic Day! Always be proud that you are Indian because not everyone gets the privilege of being born in this great nation. Happy Republic Day! Everyone who is born in this great land has only one identity - we are all Indians. Happy Republic Day! Today we are a great Republic. This would not have been possible if our freedom fighters had not made numerous sacrifices for the independence of the country. Always honour them. Happy Republic Day! The world will respect us only if we keep our heads high and take pride in the fact that we are Indians. Happy Republic Day! We would have never known what freedom is had it not been for the sacrifices made by our freedom fighters. Happy Republic Day! Our nation is the greatest in the world, but let us strive to make it even better. Our freedom was taken away from us, but because of the valiant struggles of our freedom fighters we got it back. Always cherish your independence. Happy Republic Day! A thousand salutes to this great nation of ours. May it become even more prosperous and great. Happy Republic Day! Be proud of your country, its history and heritage. Happy Republic Day! We did not get our freedom in a flash but it took many decades and numerous struggles of our freedom fighters for the attainment of independence. Let us remember their sacrifices. Happy Republic Day! Let us join hands to protect our nations from all the social evils that are plaguing it. Happy Republic Day! Have lots of fun and enjoy your freedom, but also spare a thought for the numerous sacrifices made by our freedom fighters. Happy Republic Day! Our heroes waged a valiant struggle so that the future generations could their lives with dignity. Happy Republic Day! Be proud that you are an Indian because lucky are those who are born in this great country. Happy Republic Day! Never forget the sacrifices of our great freedom fighters. Follow in their footsteps and strive to make your country the best in the world. Happy Republic Day! Freedom has not come easy. It is because of the sacrifices of ur freedom fighters that we are free. Let us cherish our independence. Happy Republic Day! As we celebrate our independence, let us also free or minds from negative thoughts. Happy Republic Day! Let us take a pledge to save the environment and keep the country clean. Happy Republic Day! Let us bow our heads in gratitude and resect for the numerous sacrifices our freedom fighters made for us. Let's take time to remember the glory of the country and feel proud of its rich heritage. Happy Republic Day! Let us do away with procrastination and start working for the development of the country. Happy Republic Day! Our valiant freedom fighters got us independence; it is now our turn to safeguard the freedom of the country. Happy Republic Day! Our freedom fighters made numerous sacrifices for the independence of the country. Let us honor them by working hard for the betterment of our nation. Happy Republic Day! Our freedom fighters gave us the gift of independence from colonial rule, it is now our turn to give the future generations the gift of a strong and corruption free India. Happy Republic Day! 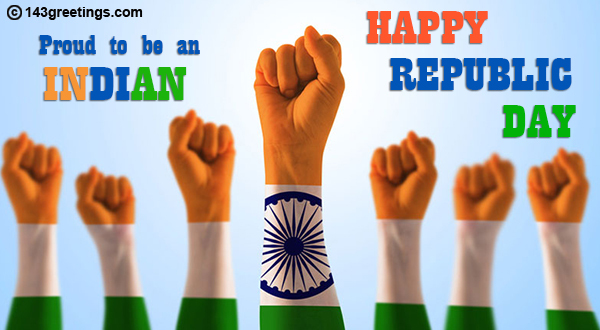 The republic day is not for celebration, it is for realization. The realization of the true meaning of independence. We celebrate republic day in school and colleges unitedly. Don’t let the word religion divide us ever. Happy republic day. Let’s make Independence day and Republic day the biggest festival of India for every religion and caste. Happy republic day! 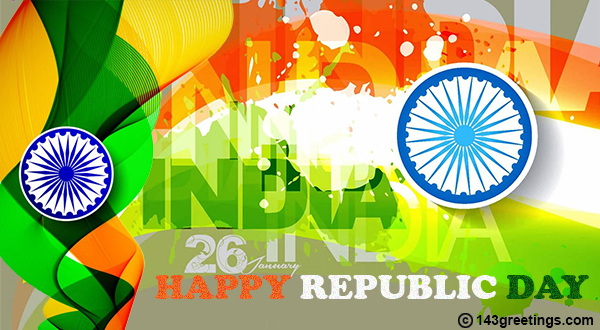 Make this republic day the biggest festival of India. Let’s get united to celebrate it and drench in color of patriotism. India is a country of religions and caste. But, respect and celebration is in every heart. Happy republic day! India is the place of lovely people, enchanting beaches. There is no place of hate, let’s not forget. Happy republic day. Our identity should be an Indian and not any caste or religion. Be a proud Indian. Happy republic day. We are one of the biggest nation in the World. Let’s celebrate the 26 January with same euphoria. I am proud that I am born in India, the heaven on earth. Happy republic day to all of you. Republic day is the day to show respect and love to all those who had scarified something for this independence. It is the time to show our love toward our nation. Happy republic day to all my friends and people in association. No country is perfect, it’s citizens make it perfect. Our country needs citizens like Gandhi, Bose, Bhagat once again. Happy republic day! Be proud we live in a country that gives us so much freedom, safety and liberty. Three rounds of applaud for India Hip hip Hurry! Hip Hip Hurry! Hip Hip Hurry! Happy republic day. Happy republic day. Let’s be united by heart and soul. Don’t ever allow anyone to break us. We will be called independent only then. Our nation has cultural and religious diversity, its good. But, diversity should be replaced with disaster ever. Stay united HRD. We are still not independent in the true sense. Let’s make it happen by lifting ourself above caste, religion and language. Happy republic day to all my dear friends. I am proud that I am an Indian, are you? Being an Indian is a proud feeling, let’s not hide it, show this to everyone. Come out and devote some time for the nation. This is the day recall the patriotism of our national heroes who had gifted this independence to us. Happy republic day. If you think India is a bad country, think about those countries where there is no democracy. You’ ill start loving India. HRD. Let’s be united and show to people that no one can break the unity of India. Be proud, be Indian. Happy republic day. Happy republic day! Today is our national holiday, let’s celebrate it differently by devoting some time for nation building. Instead of watching 26 January pared, I have decided to take part in cleanings drive. What abt u? Happy republic day. You have no rights to say India is a bad country, until ur doing something to make it better. Happy republic day. Have a wonderful republic day. Celebrate the day educating your children the history of Indian independence and our national heroes. Happy republic day to all my dear friends who are Indian by heart and soul. Great republic day wishes to dear friends. Let’s celebrate the day with zeal and enthusiasm. It is our biggest festival. Happy republic day! I’m celebrating the day devoting some time in cleaning my surrounding. Plz come and join me in this drive. Instead of sitting in-front of the TV, I will show my nation love by doing something. Are you? Happy republic day. Happy republic day, dear friends! Have a grt day. Let’s make our school memories real participating in the children’s school program. Lots of wishes for republic day. Have a wonderful year ahead. Let’s not forget to show respect to our national heroes. Remember! if Gandhi, Bhagat, Shukhdeve, Bose and many others would have thought the same way we do today, we had not got this independence. Happy republic day, let’s make this day special by doing some special things, instead of wasting our time. This Republic Day celebrate the spirit of a free and democratic country by exchanging wishes and putting your Whatsapp statuses. Don't worry if you don't have the right words as we have got you covered. Choose the best Whatsapp status given below and share it with family and friends on the occasion of Republic day. 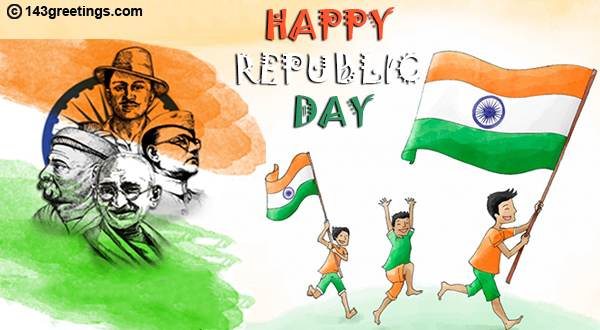 Let’s salute our nation on the republic day for everything that has given to us. Happy republic day. Happy republic day! I’m an Indian, not Hindu, Muslim, Sikh or Chiristan and I love my country. We live in a land that welcomes everything except the hatred and I am proud of this fact. Happy republic day! My patriotism for my nation is eternal , still I express it on occasions. I am Indian by heart and soul and I know the meaning of Independence very well. Happy republic day. Either it is Holi, Diwali or Eid, Muharam. Being an Indian, I celebrate all festival with the same enthusiasm. HRD. Happy republic day! Wishing you India, you have a great future and enjoy your everlasting independence. Today we are free because of the hardships faced by our freedom fighters. Let us salute them. Happy Republic Day! It is time for all of us to unite and rid our country of all the evils that are plaguing it. Happy Republic Day! Let’s remember the heroes who sacrificed their lives so that we could breath the fresh air of freedom. Let us pay homage all those who fought for the freedom of the country by following in their footsteps and making our nation the best in the world. Let us honour our heroes by working for the betterment of the nation. Let us work together to rid our lovely nation of vices like corruption and nepotism. Happy independence day, wish you a great day and a prosperous year. I love my country. Changing status to Happy republic day is not just a formality, but a deep feeling of patriotism.